This actually means the appliance is still using up electricity and wastes a considerable amount of energy. By switching off at the main power button, or even the socket, you could be saving both energy and money. 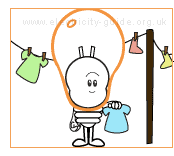 Electric tumble dryers are commonly the second biggest energy user in the home, after the fridge. They are obviously used a lot less, but still use a huge amount of electricity when switched on. You can avoid using the dryer so often by line drying clothes whenever possible or using an indoor clothes dryer when the weather is bad. If you do need to use the dryer, then ensure the clothes are as dry as possible after washing, eg, they have gone through a fast spin so that there is minimum excess water. This will reduce drying time considerably.